Learn more about the Lorex 4-Megapixel HD IP Security Camera with Color Night Vision. Get pricing, and answers to common questions. The Lorex 4-Megapixel HD IP Security Camera with Color Night Vision features color night vision technology, a 4MP image sensor, and 2k video resolution. 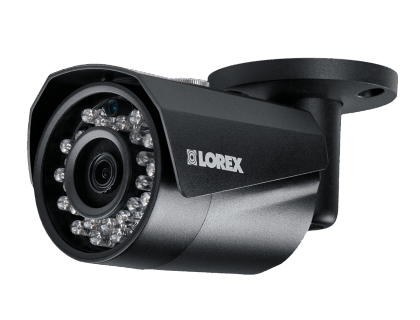 This Lorex business security system's HD quality monitoring and 83° camera lens offer fantastic fields of view that can monitor wide open areas. 4MP camera with color night vision. Pros: Superb video resolution, and great night vision capabilities. Cons: Motion detection can sometimes miss movement of objects. Bottomline: Fantastic security camera that offers an extra set of eyes for your business. What are some alternatives to the Lorex 4-Megapixel HD IP Security Camera with Color Night Vision? Where can I buy the Lorex 4-Megapixel HD IP Security Camera with Color Night Vision? The Lorex 4-Megapixel HD IP Security Camera with Color Night Vision is available via Amazon and the Lorex website. Does the Lorex 4-Megapixel HD IP Security Camera with Color Night Vision work at night? Yes. As the name suggests, the Lorex 4-Megapixel HD IP Security Camera with Color Night Vision features color night vision (CNV) technology that can see up to 130 ft. It includes digital noise reduction capabilities for low light environments. Yes, the Lorex 4K Ultra HD 8MP Nocturnal IP Camera has IP66 weatherproof ratings, and can be used in any weather. The combination of a solid unibody metal housing and corrosion-resistant aluminum body offer greater outdoor protection and can operate in extreme temperatures, ranging from -22 °F to 140 °F.